DJ Koflow (back in town after a stint in New York), DJ NEZ and resident DJ Shellsuit go deep into new and old soulful hip-hop, r&b, disco, funk, reggae and house. TFK crew members Noez, Klax, MizNek, Alot and PKST hit the graffiti wall. D.I.Y. cardboard kids playground, chalkboards, basketball hoop, and loads of green space to bring your own games or just chill with friends. Free-and family friendly. 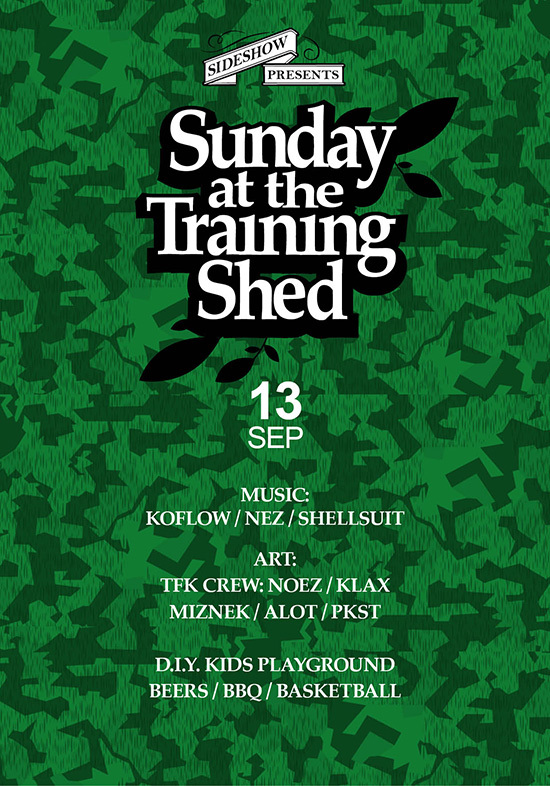 Support the artists, organisers and venue by purchasing only from the official Training Shed bar and beer station. We’ve got you covered with deals on buckets of craft beer and cider. Bring cash for faster service!